I have been drinking from the well that is Lucinda Williams since the 1988 album Lucinda Williams. I remember seeing her live at the time at the 7th Street Entry in Minneapolis. I was captured by her voice and songwriting. Nearly 30 years later and she is still putting out great material. The special treat of this album is that most of the cuts are graced by the twin guitars of Greg Leisz (left channel) and Bill Frisell (right channel). Their interplay behind the lugubrious drawl of Williams is audio perfection. The opening cut “Dust” sets the bar high with brilliant swordplay of Leisz and Frisell. The trade some great solos without overshadowing Williams, in fact they create an tall stage for her to stand on. They are brilliant accompanists. This sets the foundation for the rest of the album. Sometimes they boil and sometimes they simmer, but they are always hot. The next song, “House of Earth” was witten by Woody Guthrie. It is a dark narrative in the voice of a prostitute. “Places In My Heart” takes a softer touch – a love song to the one who breaks your heart. Real life, real love. “Death Came” has a nice Dylan feel both lyrically and musically. It is dark and brooding. After that dirge comes the joyous “Doors of Heaven.” The songs has a great tangled guitar duet as the outro. The titular track “The Ghosts of Highway” starts out disk two. It is a slow burning rocker. Highway 20 is a 200-mile interstate that cuts through the northern part of Louisiana, Williams’ home state. It is an analogy for a emotional highway of sorrow and pain, offset by nostalgia and fond recollection. “Bitter Memory” is a playful rocker. Lucinda really busts out on this piece. Which makes her slow burn on the rest of the album all that more intentional – Lucinda can rock if she wants. “Factory” is a Bruce Springsteen song (from Darkness on the Edge of Town). Lucinda makes it her own, but that is not much of a stretch. Both Lucinda and Bruce can slur their words with the best. And they are kindred spirits – especially when Bruce is in low gear. “Can’t Close The Door On Love” is another real love song – an adult love song. Love may be beautiful, but it ain’t pretty. “If My Love Could Kill” has a menacing feel to it. It reeks of the anger of a jilted lover. It reeks of revenge. With “Faith & Grace” the album ends as it began with an outstanding jam. Twelve plus minutes of a quite storm as Lucinda moans while Leisz and Frisell cut it up. This is an exquisite album. Lucinda is on top of her game with her songwriting. Her slurring drawl has been perfected to a unique and deceptively expressive instrument over the years. As I said earlier, the hook here are guitars of Leisz and Frisell. I am less familiar with Leisz than Frisell. What I love about Frisell’s work on this album is that his guitar sings in a fresh voice – this is Frisell like I have never heard him before. And the two together is so simpatico. This is not a cutting session, but a beautiful conversation between two great friends. 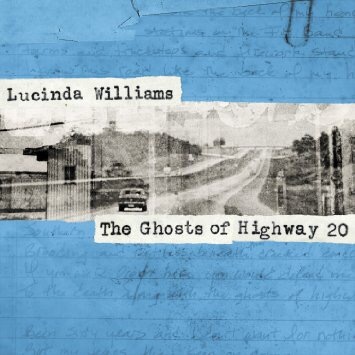 Googling The Ghosts of Highway 20 I learned the album was recorded live, without overdubs or post-production sweetening. This makes it even a more amazing album. What a breath of fresh air in our highly processed pop world. By the way I sure do dig the pricing of the CD: $10 for a double CD. But I am bummed out Lucinda and her label did not make the album available on Spotify (convince has become very important to me).